Our whole site is available for exclusive hire to suit all budgets for fun and relaxed weddings. 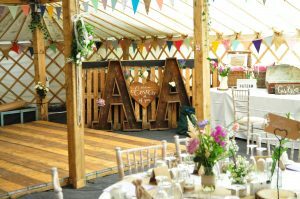 Our yurt marquee oozes rustic charm and with on site accommodation for guests, there is no better place to celebrate your country wedding. 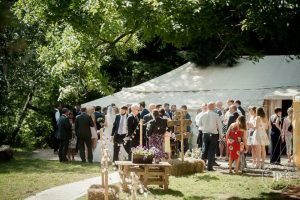 Your wedding booking provides you with exclusive use of all 5x yurts and our large yurt marquee, complete with dancefloor, stage and bar, from Friday to Sunday, allowing for plenty of set up time to make your wedding reception truly your own. Our 5x bell tents are also available to hire for your guests to use as accommodation for the weekend. 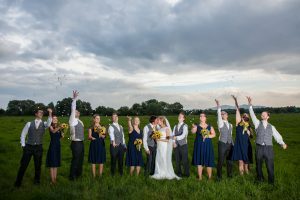 Our site is perfect for relaxed and fun festival style weddings to suit all budgets. We have preferred caterers who can provide you with whatever food options best suit your style and budget, from offering 5* silver service dinners, right through to simple pizza and burger buffets. You are however welcome to use whomever you would like for your food for the day. You can have a free bar option or choose to make use of our fully stocked cash bar. No additional corkage is payable, keeping the planning as simple as possible. 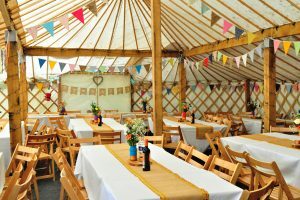 Our spectacular and unique yurt marquee can comfortably seat 140 guests at one time, and the outside area allows for evening entertainment under the stars. Decked out in colourful bunting and reams of fairy lights, the yurt marquee looks beautiful in the daytime and the partying starts. With a fire pit and wood burning braziers, the outside area can still be enjoyed once darkness falls. 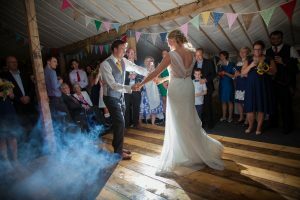 For a romantic, relaxed and family-friendly wedding that you can tailor to suit your own personalities, Weddings at Worcester Glamping truly allow you to have your wedding your way. Please note that we are not licenced to hold legal ceremonies, but we welcome and our outside setting provides a perfect outdoor setting for a mock ceremony or summer blessing. Prices start from £2,500.00 for the weekend, including yurt accommodation and use of the yurt marquee. Send us an email to info@worcesterglamping.co.uk for more details.